My research in textual studies explores the historical and material conditions of dramatic production, mediation, and reception; the theory and practice of textual editing in print and digital formats; and the cultural and institutional processes of canon formation. My foundation of two ongoing, large-scale projects, both of which have received substantial funding from external granting agencies, forms the backbone of this research. The first of these is Digital Renaissance Editions, which publishes open-access electronic critical editions of non-Shakespearean early modern drama. In addition to serving as the project’s Coordinating Editor, I am preparing a multimedia critical-performance edition of the anonymous Fair Em with Kevin Quarmby. I have also published widely on the challenges and opportunities associated with digital editions. 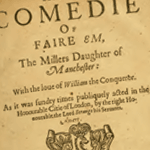 The second is Reproducing English Renaissance Drama, 1711–2016, a study of the editing and publishing of early modern English plays since the eighteenth century and their relationship to canon formation over time. The monograph coming out of this project (contracted to the Arden Shakespeare Studies in Language and Digital Methodologies series) combines quantitative methods of statistical and network analysis with qualitative and archival research. The project also involves development of a custom-built open-access bibliographical database with detailed records for every play edited 1711–2016, the Bibliography of Editions of Early English Drama. As outlined elsewhere, I am involved in a number of print and digital editorial projects. My research in computational stylistics applies quantitative and algorithmic methods to the study of literary style and authorship attribution. In 2018, I joined the Thomas Nashe Project as a Co-Investigator, tasked with overseeing stylometric work on Nashe’s dubia and stylistic analysis of his canonical works. 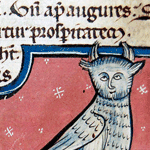 Other recent projects include an authorship attribution study of Arden of Faversham for the New Oxford Shakespeare (2016), and an article theorising and demonstrating digital methods for Shakespeare source study (2018). With Hugh Craig, I have recently completed a monograph, Style, Computers, and Early Modern Drama: Beyond Authorship (Cambridge University Press, 2017). 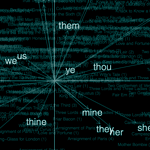 Funded by an ARC Discovery Project grant, the book identifies latent trends in genre, period, repertory, and authorial style across a large corpus of early modern plays, through the application of quantitative methods associated with computational stylistics and authorship attribution. It is the first monograph of its kind in the field of Shakespeare and early modern studies, and it provides a model and rationale for future scholarship. My ‘non-digital’ critical work on literary and cultural history focuses on the transmission of texts, images, and other cultural forms and their adaptation to suit changing socio-political agendas. Recent projects include articles on Jews and Judaism (2015, 2016), and an article on Catholicism, witchcraft, and Elizabethan court drama (2014).